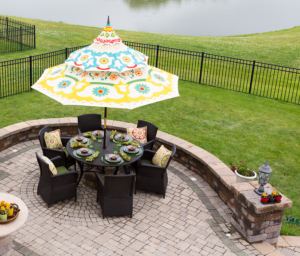 Have you been looking for a way to get more use out of your yard? Perhaps you’d like to add a patio with outdoor seating or create a walkway to your front door. Whatever you have in mind, Allmaster Home Services can make it happen with beautiful patio pavers. Since 1987, we’ve been transforming the yards of Bethesda homeowners, providing top-quality products and unmatched customer service that has earned us an A+ rating with the Better Business Bureau. All of our elegant patio pavers are also extremely durable and will resist cracking or chipping to keep your yard looking beautiful for years down the road. The first step to enhancing your outdoor space is having Allmaster come to your home for a complimentary consultation. During this meeting, we will sit down with you to discuss what you’re trying to achieve, and from there we’ll develop a presentation of what the finished project will look like. You’ll also be assigned a project manager who will walk you through every step of the installation process and be your point of contact from start to finish. For a new patio, walkway, or other enhancement, reach out to Allmaster Home Services today. We install patio pavers for homeowners in Bethesda and surrounding Maryland communities.